Week 3 of my ‘World Cup Workout’ and I am already starting to feel the benefit! I feel more toned and my energy levels are on the up 🙂 Although I have still got a long way to go, I have to say I am really enjoying the exercises! Sticking with the healthy theme, the dish I have chosen this week is Lentil Curry. Although it is a guilty pleasure, I love having poppadoms and chutney with a takeaway curry. Sometimes I buy the ready-made poppadoms from the supermarket and whip up some homemade chutney to go on the side. This time, I decided to make some of the chutneys you would use with poppadoms, wrap them in a tortilla and slice into mini bites to eat with the curry. This means you don’t need to serve the curry with rice. 1 tbsp. tomato purée mixed with half a mug of hot water. Cook the lentils as per the cooking instructions on the packet. Whilst the lentils are cooking, chop the carrots, onion, garlic and courgettes into little pieces and fry in a large frying pan until soft. In a separate high sided frying pan, add the garam masala, curry powder, fenugreek, cumin seeds, turmeric, cinnamon and ground and heat on a low heat until you can smell an aroma (approximately 3-5 minutes) keep stirring so it doesn’t burn. Next, add the tomato purée, oil, sugar and lemon juice to make the paste. For the mini wrap salad and relish rolls Chop the onion, cucumber and cherry tomatoes into little pieces. When chopping the tomatoes, just use the skin and take out the pulp. Keep aside a third of the cucumber. Mix the tomato, thenrest of the cucumber and onion together into a small bowl. In another small bowl, add three tablespoons of yoghurt. Add the mint sauce and stir to make your mint yoghurt sauce and add the cucumber you have kept aside into the bowl with the yoghurt. Take two tortilla wraps and spread over the mint yoghurt mixture over both wraps Roll into a tight roll and slice into small pieces. Take the other two tortilla wraps, spread the mango chutney over them and spoon over the onion, tomato and cucumber mix. Sprinkle some fresh coriander over, roll up and slice into mini wrap pieces. To serve, place some curry onto the middle of the plate and place the mini wraps around the edge. Finally sprinkle the rest of the fresh coriander over the curry. Experiment with your relishes. My husband likes the lime pickle, which would definitely give the wraps some spice! This curry also works with chickpeas instead of lentils. When I was young, I used to be a fussy eater and would never eat anything with spices in. Now I eat almost anything! Of course, there are still some types of food I avoid but my general guideline when it comes to eating or cooking is to be daring. Using spices is great way of adding flavour, without needlessly adding extra salt. My flavour of the moment is garam masala- I make my own curry using this and other spices. In fact, as my love of cooking grows so seemingly does my spice rack! When I cook with spices, I just shake them in the food and rely upon my own culinary judgement to shape the dish but in the recipe below I have tried to be a bit more accurate with the measurements. Therefore if you feel you want to add more spice, please do so. I do not like using ready-made sauces in my dishes so I spent some time reading up on recipes and experimenting with spices before coming up with the recipe below. Experimenting can be fun and luckily I haven’t had too many disasters! 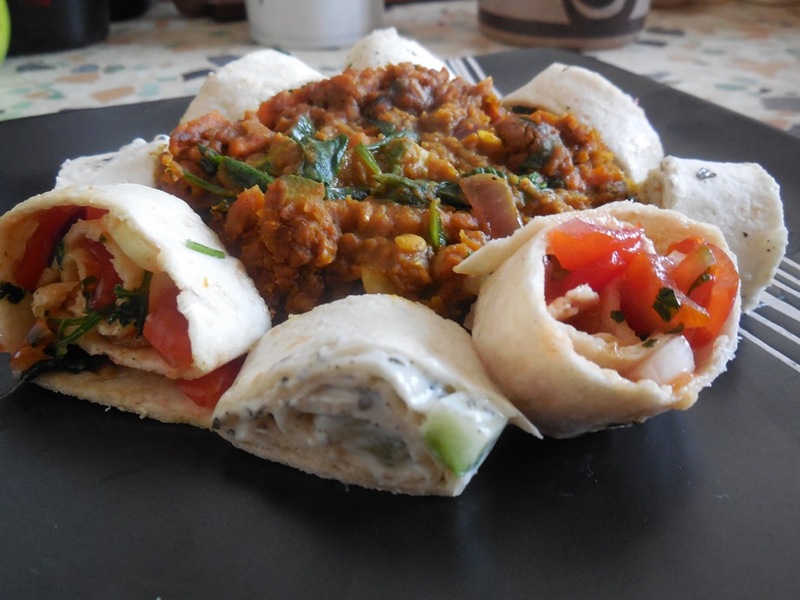 If like me, you love the dips and relishes you get with poppadoms, you should like my recipe as I combined some of these relishes with the chicken curry and put them all in a wrap. They can be eaten for lunch or dinner and are tasty both hot and cold! Chop the chicken into small chunks. Into a large saucepan, on a low heat, add the curry powder, garam masala, fenugreek, turmeric, cumin seeds, mustard powder and the chilli powder. Mix for three minutes ensuring the ingredients don’t burn. Add in the oil, lemon juice and sugar. This will make your curry paste. Turn the heat up on the saucepan and add the chicken to the curry paste. Remember to keep stirring so the paste covers all the chicken. Allow to cook through. Grate the carrot, slice the onion lengthways and chop the cucumber into thin strips. Mix these ingredients up in a bowl. Slice the courgettes into thin batons and add to the chicken. Once the chicken and courgettes are cooked, chop up some coriander and add to the chicken. The final part is to assemble your wrap. Heat up the tortilla wraps in the microwave. Spread 1 tbsp. of mango chutney over the tortilla wrap. 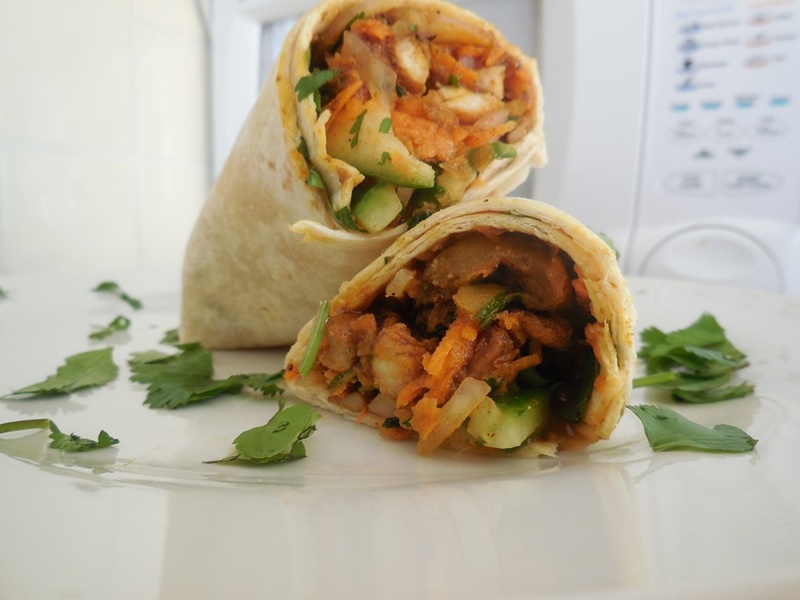 Take a quarter of the carrot, onion and cucumber mixture and place onto the tortilla. Finally, add a quarter of the chicken mixture over the carrots, wrap and serve. Try chopping the wraps into bite size chunks. Great for serving to guests! I often buy chicken in large quantities, chop into chunks and freeze, ready to use when needed. My friend Nikki told me to flat pack the chicken in freezer bags so if you forget to take the meat out of the freezer (like I do!) it doesn’t take such a long time to defrost! It has taken me a while to buy all the spices in the ingredient list but I started with curry powder and garam masala and just bought the others when I could. The wrap would work with these two ingredients but I like to experiment with new spices. In future, I would love to make my own curry powder mix and my own mango chutney.